Despite Face Tattoo, This Man Is Presidential Contender - kaycee Weezy! When the candidates for president of the Czech Republic meet in a televised debate tonight, by far the most colorful contender will beVladimir Franz. His entire head is tattooed. Despite his wildly unorthodox appearance Franz has a respectable 11.4 percent of the popular vote in opinion polls, placing him third among the nine candidates, a position that could make him a Czech king maker. Franz, 53, holds a law degree, is a Czech drama professor, a painter and a prolific opera and theater composer. 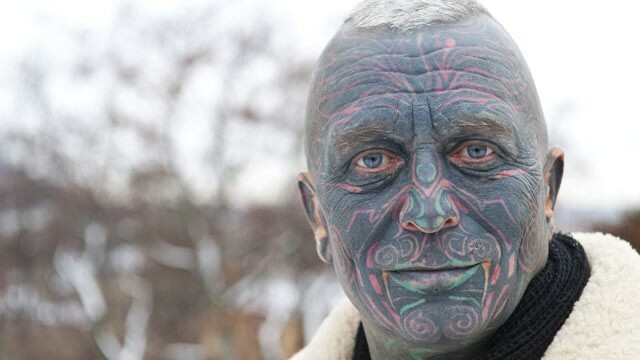 He also has tattoos covering 90 percent of his body, a variety of body piercings and dyed blue hair. "Today is the biggest day of my art career and of my political career," Franz told ABC News. "I have a world opera premiere of Karel Capek's novel 'War With the Newts' in the National Opera at 7 p.m. and a national TV debate at 8 p.m."
Voting will take place this weekend and a runoff is scheduled for the weekend of Jan. 25 and 26. The runoff will likely feature leftist Milos Zeman and his right-wing rival, Jan Fischer. Franz is running as an independent whose political views are far less extreme than his carney sideshow looks. And he is proud of his looks. "My tattoos are my private little garden. They are not a handicap, they are added value," Franz said. "Elections are not a beauty contest. It is all about tolerance." He is intent on expanding his work to the art of politics. "It is not time to be an artist only in the Czech Republic now, you have to act as an citizen. I think a piece of pure heart would not harm our politics," Franz said. He rhetoric is that of a grass roots politician. "I want to return the state to its citizens. I want to be an ambassador of the people in high politics. I want to fight for the people," he says as if he's said it before during his campaign around the country over the past few months. "My four pillars are: education, culture, morality and tolerance," Franz states. Franz's appeal lies primarily in the country's under-30 voters where he polls one-third of the vote, making him the most popular of the nine candidates. "He is not hungry for power like other candidates," said Jan Herzmann, managing partner of PPM factum pollster. "All he wants to do is cultivate Czech political scene." "Everything about this colorful candidate is different. His appearance, lack of political experience, and the fact that he was pushed by his friends and fans to the presidential race. He is the only strong opposition to the current Czech political scene," Herzmann said. Franz is attracting support from some establishment folks as well as the youth. Pavel Kohout, a leading economist, offered his services for free. "I respect him for a number of reasons, but the fact that he is not compromised in any way singles him out as the best candidate," Kohout said.